WORD FAMILY BUNDLE SET! FOUR WORD FAMILIES IN ONE EASY TO USE SET. 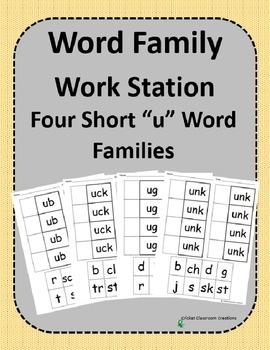 Literacy Centers/ Work Stations or Independent practice sheets using the -UB, -UG, -UCK and the UNK Word Families. 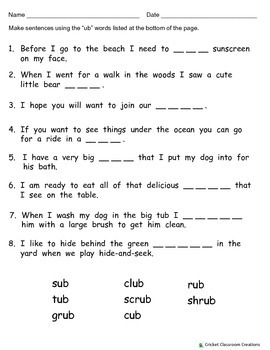 These activities provide great practice for First Graders, for more advanced Kindergarten students or as a beginning of the year review for struggling Second Graders. 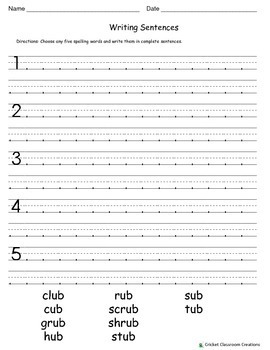 Making Words Cut and Paste - I staple this along with the Making Sentences (fill in the blank) sheet and use it as one of my Word Stations. This is ideal, especially if you follow the Daily Five by: Gail Boushey and Joan Moser. Writing Sentences allows students to choose from the list of Word Family Words and write their own sentences using those words. Another great Work Station! 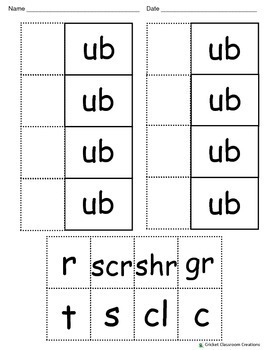 COVERSHEETS FOR ALL FOUR WORD FAMILIES INCLUDED. Put these booklets together by stapling one coversheet with several of the provided booklet pages. Students write the Word Family words and illustrate in the space provided. Afterward they love to color in the title on the coversheet. Later in the year, or for more advanced students, I switch to the "My Book of -ub Word Family Sentences" booklets. AGAIN, COVERSHEETS FOR ALL FOUR WORD FAMILIES INCLUDED. Assemble by using a coversheet and enough half-sheet size pages to allow them to write sentences with all of the spelling words for that week. Students write each word in complete sentences and illustrate in the space provided. Each of these Word Family Sets follow the same basic format to foster student independence through familiarity.